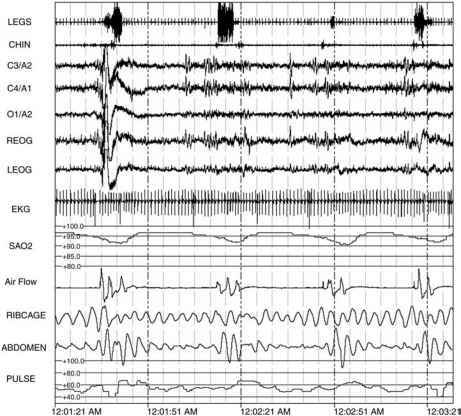 FIGURE 1 Overnight polysomnogram showing repetitive obstructive apneas. Channels recorded: both legs (on single channel); electroencephalogram (EEG) from standard locations left central/right auricular reference EEG (C3/A2), right central/left auricular reference EEG (C4/A1), left occipital/ right auricular reference EEG (O1/A2); left (LEOG) and right (REOG) electrooculogram; electrocardiogram (EKG); oxygen saturation (SaO2); airflow, measured by oro-nasal pressure transducer; respiratory effort of ribcage and abdomen; and pulse rate. In this 3-minute example, there are at least five apneas with only modest oxygen desaturation, none below 90%. patients a diagnosis of sleep apnea may be established on more simple recordings. This has led to a number of recording devices ranging from simple oximetry, snoring sound, respiratory effort, and airflow to full portable attended PSG devices. A number of portable monitoring techniques have been developed over the past 20 years in an attempt to simplify the ambulatory diagnosis of sleep apnea. Some showing initial promises are either no longer available [i.e., Nightwatch™, Respironics, Murrysville, Pennsylvania, U.S. (33,34)] or no longer marketed for a diagnostic purpose [i.e., AutoSet®, ResMed, Poway, California, U.S. (35,36)]. Currently available devices range from comprehensive portable polysomnography to simple oximetry. A committee of the American Academy of Sleep Medicine, American Thoracic Society, and American College of Chest Physicians (37) classified portable monitors into three categories: (i) Type 2 monitors include a minimum of seven channels, including EEG, EOG, chin EMG, ECG or heart rate, airflow, respiratory effort, and oxygen saturation; (ii) Type 3 monitors include a minimum of four channels, including ventilation or airflow (at least two channels of respiratory movement, or respiratory movement and airflow), heart rate or ECG and oxygen saturation; and (iii) Type 4 monitors, where most monitors of this type measure a single parameter or two parameters. For comparison, Type 1 monitoring is in-laboratory, attended polysomnography. A comprehensive monitor has been successfully used in the large-scale Sleep Heart Health Study (P-Series PS2, Compumedics Limited, Victoria, Australia). Where home and in-lab PSG were compared, median respiratory disturbance index (RDI) was similar in the unattended home and attended laboratory setting with differences of small magnitude in some sleep parameters (38). Differences in RDI between settings resulted in a rate of disease misclassification that is similar to repeated studies in the same setting. The DigiTrace Home Sleep System (DHSS, SleepMed, Inc., Columbia, South Carolina, U.S.) can acquire, store, and analyze full polysomnographic data in the ambulatory setting as illustrated in the study by Fry (39). In this study of 77 subjects, more than 95% of all epochs were scorable for sleep and breathing parameters. While these data suggest that full polysomnography can be extended to large patient populations, potentially freeing up valuable lab resources, such an approach has not yet become widely accepted. One likely reason is the need for much technical expertise. Therefore simpler, patient-friendly, even patient-applied devices are more desirable. The EdenTrace® II Recording System (Nellcor Puritan Bennett Ltd., Kanata, Ontario, Canada) is a portable monitor that measures nasal and oral air flow via thermistry, chest wall impedance, snoring intensity, oxygen saturation via finger pulse oximetry, heart rate, and body position. Movement is detected by electrical comparison of the signals from the ECG and the pulse oximetry, and discrepancies between these channels are indicated as "motion" on the saturation channel. Several studies have been performed comparing either the ambulatory device only in the laboratory with simultaneously recorded polysomnography, or both home and laboratory recordings (40-43). In all studies there is good agreement between the AHI measured in the laboratory and with the EdenTrace device in the ambulatory setting. Ten percent or more of studies required repetition because of difficulty with recordings; the study by Whittle et al. (43) suggested that home sleep studies have benefits in terms of time and cost, but for diagnostic reliability, an in-laboratory sleep study may be required in more than half of the cases. The Embletta® Recording System (Medcare, Reykjavik, Iceland) consists of a nasal pressure detector using a nasal cannulae/pressure transducer system (recording the square root of pressure as an index of flow), thoracoabdominal movement detection through two piezoelectric belts, a finger pulse oximeter, and a body position detector. This technology is part of the parent in-lab PSG system (Embla®). Dingli et al. (44) performed a synchronous comparison to polysomnography in 40 patients and a comparison of home Embletta studies with in-laboratory polysomnography in 61 patients. Sleep apnea was classified as definite (AHI > 20), possible (AHI 10-20), and not present (AHI < 10) based on Embletta results in symptomatic patients. Using this classification, all nine patients categorized as not having sleep apnea AHI < 15 on PSG and all 23 with definite sleep apnea on Embletta had an AHI > 15 on polysomnography. 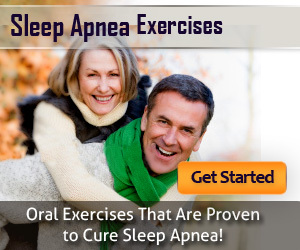 Eighteen patients fell into the possible sleep apnea category potentially requiring further investigation and 11 home studies failed. Most patients were satisfactorily classified by home Embletta studies but 29 out of 61 required further investigations. The study suggested a 42% saving in diagnostic costs over polysomnography if this approach were adopted. The Stardust® Sleep Recorder (Respironics, Murrysville, Pennsylvania, U.S.) detects nasal airflow and snoring (pressure sensor); thoracic or abdominal movement (one strain gauge); arterial oxygen saturation and pulse rate (finger probe); and body position. There are limited published data with this device. One in-lab study from Japan found that Stardust and PSG AHI correlated well with a mean bias of 3.7 ± 13.1/hour (45). Specificity was lowest (25%) in patients with milder sleep apnea (AHI < 15) increasing to 97% with AHI > 50. Sensitivity was high (> 90%) at any level of PSG-derived AHI. We found similar results (K Ferguson, personal communication) but much more data are needed to properly determine the role of this and similar devices. 64 patients (negative predictive value, 96.9%). In a more recent albeit smaller study by Hussain and Fleetham (52) all (12 of 30) patients with sleep apnea had a 2% oxygen desaturations index of less than 10/hour. The sensitivity of oximetry increased at lower desaturations indices but this was associated with decreased specificity. Review of oximetry waveform pattern, by experienced physicians, did not improve the diagnostic accuracy. Combining oximetry with a clinical prediction rule would have reduced the need for polysomnography by 30%. The authors concluded that many patients, who present with snoring and/or witnessed apnea and are referred to a sleep disorder clinic for suspected OSA, may have significant OSA even if they deny EDS. Despite the extensive literature on oximetry, there is no uniformity in the results. This can be explained by the fact that different devices record at different sampling rates, store and analyze the data in different ways. Moreover, and perhaps more importantly, the definition of sleep apnea-hypopnea is not uniform amongst studies. The Calgary group has added a measurement of snoring to saturation detection in an attempt to improve the ambulatory diagnosis of sleep apnea. In an initial report, they compared the SnoreSat® (SagaTech Electronics, Calgary, Alberta, Canada; now known as the Remmers Sleep Recorder) with standard overnight polysomnography (53). Depending on the severity of apnea and the referral population, the sensitivity and specificity of the monitor in detecting OSA ranged between 84% and 90% (sensitivity) and 95% and 98% (specificity). In subsequent studies comparing both at-home with simultaneous in-laboratory measurements (54), the PSG-derived AHI and oximeter-derived RDI were highly correlated (R = 0.97). The mean (2SD) of the differences between AHI and RDI was 2.18 (12.34)/hour. The sensitivity and specificity of the algorithm depended on the AHI and RDI criteria selected for OSA case designation. Using a cut-off of 15/hour for AHI and RDI, the sensitivity and specificity were 98% and 88%, respectively. If the PSG-derived AHI included EEG-based arousals as part of the hypopnea definition, the mean (2SD) of the differences between RDI and AHI was -0.12 (15.62)/hour and the sensitivity and specificity profile did not change significantly. While these data suggest that oximetry, or oximetry combined with snoring measurement, may be used in identifying patients with OSA, it is important to remember that not all oximeters are made equally and that some events may not be detected by some devices in some situations (55-57). Indeed, the same group found that oximetry is not useful in a pediatric population (58). Using different devices with different algorithms have shown different results and clinicians need to be aware of these limitations when interpreting the literature. Snoring is added to oximetry in a number of other devices included MESAM IV® (Madaus Medizin-Elektronik, Cologne, Germany) and the newer ARES™ Unicorder (Apnea Risk Evaluation System, Advanced Brain Monitoring, Inc., Carlsbad, California, U.S.) (heart rate is also recorded; thus these do not technically fit with the classification but are included for completeness). The MESAM IV recording device, widely used in Europe, evaluates sleep-disordered breathing based on an analysis of snoring and saturation change as well as heart rate. Cyclical variation of heart rate in association with decreases in saturation and snoring are taken into account at the same time to determine sleep apnea. Several previous studies evaluating the diagnostic validity of MESAM IV have had conflicting results (59-63). This is because not all studies have the same design, patient populations varied and diagnostic criteria were different. The ARES™ Unicorder is easily affixed to the forehead by the user and acquires data on oxygen saturation, airflow (nasal pressure), pulse rate, snoring level (microphone), and head position/movement (accelerometers). Proprietary ARES™ software uses oxygen saturation measured by pulse oximetry (SpO2) as the primary signal, and analyzes changes in pulse rate, snoring sounds, head movement, and the slope of the resaturation curve to identify behavioral markers of arousal that follow desaturation events. The analysis algorithm assumes that desaturation events are terminated by arousal due to sleep apnea. A study by Westbrook (64) reported 284 valid comparisons of in-laboratory simultaneous polysomnography and ARES™ and 187 valid comparisons of in-laboratory polysomnography with a separate two nights of unattended self-applied ARES™ recording. Using a diagnostic AHI cut-off > 10 to establish the accuracy and validity of the ARES™, the concurrent in-laboratory comparison yielded a sensitivity of 97.4%, a specificity of 85.6%, a positive predictive value of 93.6%, and a negative predictive value of 93.9%; in-home comparison sensitivity, specificity, positive predictive value, and negative predictive value were 91.5, 85.7, 91.5, and 85.7%, respectively. The authors concluded that the ARES™ demonstrates a consistently high sensitivity and specificity for both in-laboratory and inhome recordings; and that for patients at risk for sleep apnea who do not a priori need an attended study, the ARES™ could provide a low-cost alternative to traditional polysomnography. A wrist-worn device, Watch-PAT 100 System (Itamar Medical Ltd., Caesarea, Israel) has been developed to detect OSA. The peripheral arterial tonometry (PAT) technology is based on the principle that episodic vasoconstriction of digital vascular beds from sympathetic stimulation (mediated by alpha receptors) causes attenuation of the PAT signal and that discrete obstructive airway events (e.g., apneas, hypopneas, and upper airway resistance) cause arousals from sleep, sympathetic activation, and peripheral vasoconstriction (65). Thus, this represents a noninvasive measurement of variable sympathetic activation that occurs as part of sleep-disordered breathing events. Two finger probes extend from the main body of the device: one is the pneumo-optical sensor that detects the PAT signal; the other measures arterial oxygen saturation. The body of the device also contains an actigraph, which is used to estimate sleep. The finger-mounted pneumo-optical sensor eliminates venous pulsations and continuously measures the pulse volume of the digit. An automated computerized algorithm is used to calculate the frequency of respiratory events per hour of actigraphy-measured sleep. This algorithm also incorporates the PAT signal attenuation and the oxygen desaturation. Ayas et al. (66) found good correlation between the Watch-PAT 100 System and the gold standard PSG. Schnall et al. (67) found a high correlation between standard polysomnography-scored apnea-hypopnea events and PAT-vasoconstriction events with concurrent tachycardia in an initial study with the bedside version of the system. Bar et al. (68) showed that detection of apnea and hypopnea events based on combined data from PAT and pulse oximetry was highly correlated with standard polysomnography-scored results, a finding confirmed by Pittman et al. (69) using both manual and automatic analysis. A more recent study from Sweden compared the Watch-Pat 100 System with simultaneous in-home unattended full PSG (70). Subjects were instrumented in the lab for full PSG (using the Embla system, Medcare, Reykjavik, Iceland) and the Watch-Pat 100 System and sent home for overnight study. The accuracy of the Watch-Pat 100 System in RDI, AHI, oxygen desaturation index (ODI), and sleep-wake detection was assessed by comparison with data from simultaneous PSG recordings. The mean PSG-AHI in this population was 25.5 ± 22.9 events per hour. The Watch-Pat 100 System RDI, AHI, and ODI correlated closely at 0.88, 0.90, and 0.92, respectively ( p < 0.0001) with the corresponding indexes obtained by PSG. The AUC for the ROC curves for Watch-Pat 100 System AHI and RDI were 0.93 and 0.90 for the PSG-AHI and RDI thresholds 10 and 20, respectively ( p < 0.0001). The agreement of the Sleep-Wake assessment based on 30-second bins between the two systems was 82 ± 7%. The authors concluded that the Watch-Pat 100 System was reasonably accurate for unattended home diagnosis of OSA in a population sample not preselected for OSA symptoms. Moreover, they proposed simultaneous home PSG recordings in population-based cohorts as a reasonable validation standard for assessment of simplified recording tools for OSA diagnosis. A number of devices combining airflow measurement with oximetry are available primarily in Europe. These include the Reggie (oximetry, airflow, actigraphy (71); Camtech Ltd., Sandvika, Norway) and the SOMNOcheck® (oximetry, flow, snoring, heart rate and position (72); Weinmann Diagnostics GmbH and Co. KG, Hamburg, Germany). As with other devices reasonable agreement with in-lab PSG have been reported but limited data prevent widespread use or endorsement at this time. Recognizing that a suprasternal pressure transducer can accurately reflect respiratory efforts (73), Nakano et al. (74) have developed a novel method of using tracheal sound analysis for the diagnosis of sleep apnea-hypopnea syndrome. In a retrospective study involving 383 patients for suspected sleep apnea-hypopnea syndrome, overnight polysomnography with simultaneous tracheal sound recording was performed. The AHI was calculated as the number of apnea and hypopnea events per hour of sleep. Tracheal sounds were digitized and recorded as power spectra. An automated computer program detected transient falls (TS-dip) in the time series of moving average of the logarithmic power of tracheal sound. Tracheal sound-respiratory disturbance index (TS-RDI) was reported as the number of TS-dips per hour of examination and the ODI was calculated as the number of SaO2 dips of at least 4% per hour of examination. The TS-RDI highly correlated with AHI (r = 0.93). The mean (± SD) difference between the TS-RDI and AHI was -8.4 ± 10.4. The diagnostic sensitivity and specificity of the TS-RDI when the same cut-off value was used as for AHI were 93% and 67% for the AHI cut-off value of 5, and 79% and 95% for the AHI cut-off value of 15, respectively. The agreement between the TS-RDI and AHI was better than that between the ODI and AHI. The authors concluded that fully automated tracheal sound analysis is useful for the portable monitoring of the sleep apnea-hypopnea syndrome. 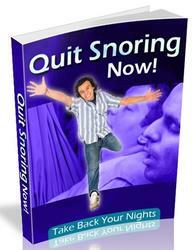 Discover How to Stop Snoring Quickly & Easily … Without Undergoing Any Risky Surgery! 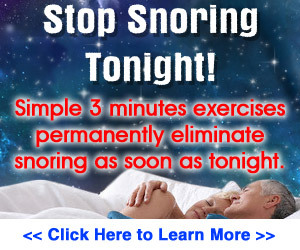 Here’s Your Chance to Learn Astonishing Non-Surgical Cures for Snoring That Will Have You Sleeping & Feeling Better in No Time!